Herefordshire produced one of their best-ever Minor Counties Championship wins with an eight-wicket success over Dorset at Brockhampton. Skipper Chris Boroughs was delighted by the efforts of his side against last season's champions. He told BBC Hereford and Worcester: "We had few selection headaches in the week leading up to the game. "To win under those circumstances was great but to do it inside two days was even better." Herefordshire had a first-innings lead of 69 runs and they maintained the pressure throughout as Dorset could manage only 185 in their second innings. This left the home side requiring only 117 for victory and Steve Adshead (71) and Dave Exhall (41 not out) saw them home. But the stand-out performance for Herefordshire was the bowling of Callum Stewart who returned match figures of 11-123. Boroughs felt Stewart deserved a lot of credit for the efforts he has put into improving his game. "He made his Minor Counties debut at the beginning of last season and struggled for the first couple of games," Boroughs added. "Last season he was improving game-by-game and we have certainly found that again this season. "The hard work that he has been putting in has certainly been rewarded over these last two days." Boroughs believes this win would give the side a major boost ahead of what will be a tricky trip to Berkshire in their next match. "We've got a belief in the side now but we do need players to be available and we do need to be able to pick a balanced side," he said. "Certainly the wicket is going to turn at Berkshire because they have got two very good spinners. "We need to make sure we have got options in that department but we need to take the confidence from this win and kick-on from there." 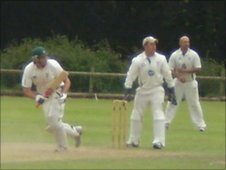 Herefordshire will take on Berkshire at Finchampstead in a Minor Counties Championship match, beginning on Sunday, 24 July.